Footage of JFK speaking in West Berlin during his visit to the city on the Cold War’s front lines on June 26, 1963. VS, crowds applauding as President Kennedy finishes speech. 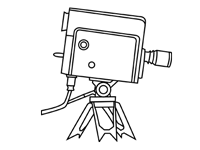 LS, MS, Television camera operating from stand. Additional scenes of crowds.